On April 22nd, 2016, I worked on Mt. Fichtelberg (1215 m above sea level) in the German Ore mountains. I noted several interesting phenomena in the sky. An upper air flow from southerly directions had brought in Saharan dust as indicated by a prominent ring of Bishop around the sun, which had already been visible since the day before. On the 22nd, aerosols produced a rather milky sky, with additional thin and high Altocumulus lenticularis clouds due to foehn from the south. These clouds showed a pronounced iridescence when coming close to the sun. This motivated me to investigate the sky in the proximity of the sun in more detail by using dark sunglasses, as it would have been a pity to miss these gorgeous colors. Only because of my increased attention towards the vicinity of the sun I was able to observe a very small and slightly elliptical halo around the sun, which repeatedly vanished and reappeared every time the next cloud approached the sun. Its radius was only about 1°-2°. Each period of visibility lasted about several seconds up to one minute. Remarkably, no distinct virga was visible in front of the sun when the halo appeared, however, a high amount of virga clouds be seen at other positions in the sky. 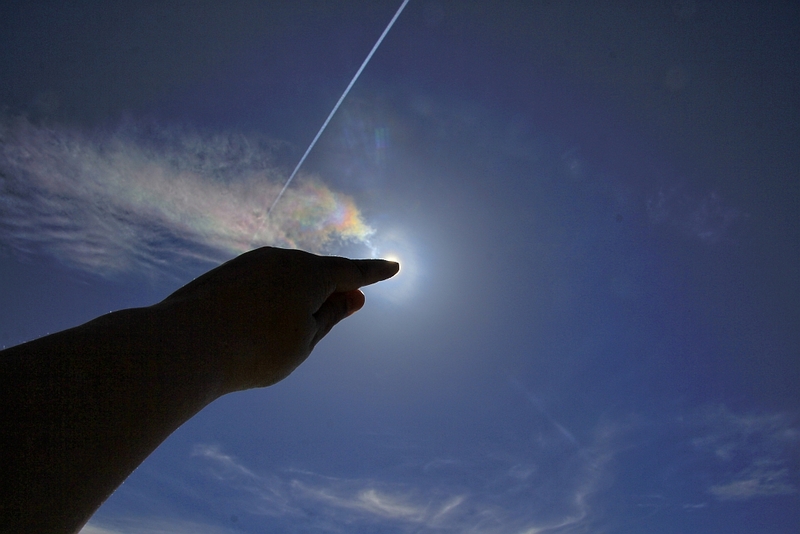 Therefore it seems likely that the ice crystals responsible for the elliptic ring might also have been part of a (nearly invisible) virga cloud. I did observe elliptical halos at previous occasions, but never before of such a surprisingly tiny size. This entry was posted in rare cirrus halos and tagged elliptical halo, small radii. Bookmark the permalink. Especially the combination of the rare halos with the iridescence is amazing. Great observation!